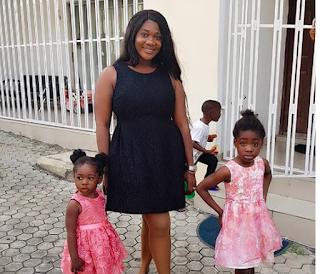 Nollywood Actress, Mercy Johnson who seems to love children very much and she's not bothered about whether or not it will affect her career was spotted just recently with her beautiful kids, Purity, Henry, Angel in a post she shared on her social media page. The excited mother of three who couldn't get hold of herself was seen holding hands with her children wearing a smile, dressed in nicely black gown with feather-inspired flip flops to complement them all as you can see from the photos below. 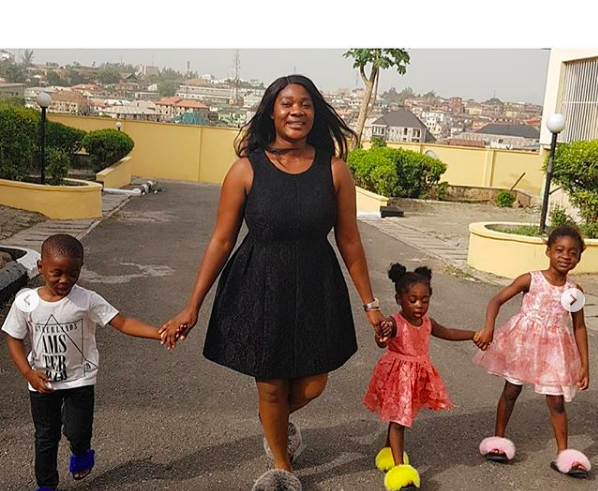 The beautiful on-screen character, Mercy Johnson is happily married to Prince Odianosen Okojie in 2011. The couple has two daughters and one son born in 2012 (Purity), 2014 (Henry), 2015 (Angel).